Antibiotics save lives and are essential for the practice of intensive care medicine. Adequate antibiotic treatment is closely related to outcome. However this is challenging in the critically ill, as their pharmacokinetic profile is markedly altered. Therefore, it is surprising that critical care physicians continue to rely on standard dosing regimens for every patient, regardless of the actual clinical situation. At present, therapeutic drug monitoring may be of help, but has major disadvantages, remains unavailable for most antibiotics and has produced mixed results. Antibiotic dosing regimens are usually based on data from healthy volunteers with normal physiology or non-critically ill patients. However, in critically ill hospitalized patients, pathophysiological changes may have profound effects on the primary determinants of the pharmacokinetics (PK) of hydrophilic antibiotics which are distributed to interstitial fluid and that are predominantly excreted via the kidneys (like β-lactams, aminoglycosides, glycopeptides). Extravascular volume expansion with fluid loading in the setting of capillary leak (poor source control) may alter their volume of distribution (Vd), while changes in renal function can significantly influence drug clearance (Cl). The β-lactams are the most commonly prescribed antibiotics in the critically ill. Since bacterial killing is considered time-dependent, the pharmacodynamic (PD) parameter of interest is the fraction of time that the free drug concentration exceeds a minimum inhibitory concentration (MIC tested in vitro) of the causative microorganism – the fT>MIC. 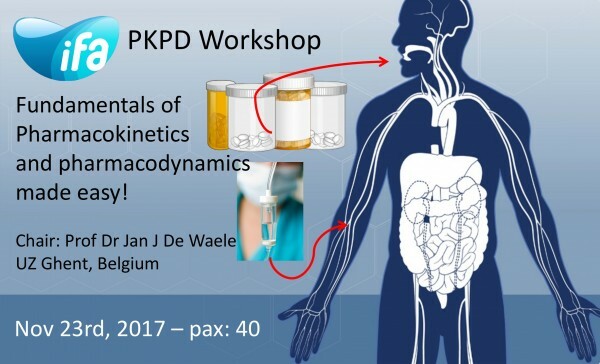 Learning objective: This workshop will outline the basic pharmacokinetic and pharmacodynamic principles that underlie the need for individualized and personalized drug dosing. Right dose, right now: using big data to optimize antibiotic dosing in the critically ill. Paul W.G. Elbers, Armand Girbes, Manu LNG Malbrain, Rob Bosman. DOI: 10.5603/AIT.a2015.0061. Anaesthesiol Intensive Ther 2015;47(5):457-463. A pilot study on pharmacokinetic/pharmacodynamic target attainment in critically ill patients receiving piperacillin/tazobactam. Jiřina Martínková, Manu L.N.G. Malbrain, Eduard Havel, Petr Šafránek, Jan Bezouška, Milan Kaška. DOI: 10.5603/AIT.a2015.0082. Anaesthesiol Intensive Ther 2016;48(1):23-28.